Simulating internal combustion (IC) engines is challenging due to the complexity of the geometry, spatially and temporally varying conditions, and complex combustion chemistry in the engine. With a host of tools to address these challenges, CONVERGE is a powerful tool for quickly obtaining accurate CFD results for your IC engine. One of the biggest hurdles in solving IC engine combustion is spending computational resources effectively. In a complex IC engine case, mesh resolution requirements to capture relevant flow features can vary significantly in time and space. This is a challenge that Adaptive Mesh Refinement can easily solve. CONVERGE’s SAGE detailed chemistry solver uses local conditions to calculate reaction rates based on the principles of chemical kinetics. This solver is fully coupled to the flow solver, but the chemistry and flow solvers parallelize independently of one another, which speeds up the simulation. With the appropriate mechanism, the SAGE solver can predict a wide range of cases (e.g., a variety of fuels [premixed, non-premixed, partially premixed, multiple fuels], emissions modeling, and unique phenomena such as end-gas auto-ignition). With its accuracy and robustness, CONVERGE can perform predictive modeling instead of merely confirming experimental results. 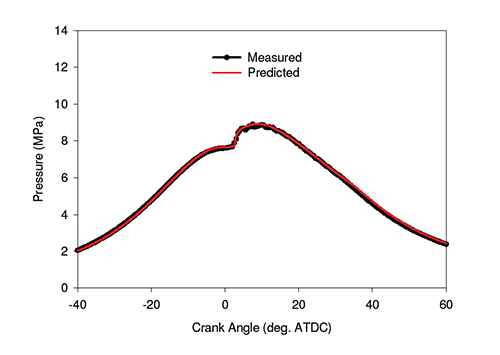 Comparison of measured and predicted average cylinder pressure for a diesel engine. 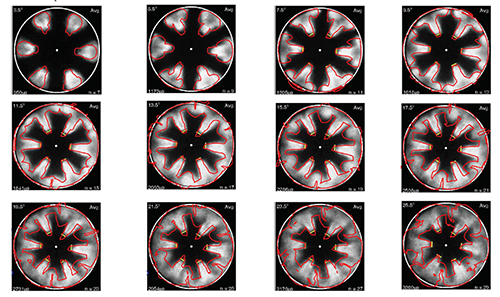 Comparison of averaged chemiluminescence experimental images showing flame location (grey) with simulation results (red outline) for various times throughout the combustion event. Detailed chemistry modeling can be expensive, and so CONVERGE incorporates numerous acceleration strategies such as adaptive zoning, dynamic mechanism reduction, and stiffness-based load balancing. These techniques, coupled with strategies to speed up species transport, allow you to use more detailed reaction mechanisms to accurately simulate kinetically limited phenomena and emissions. CONVERGE also contains utilities for zero-dimensional ignition delay, mechanism merging and reduction, sensitivity analysis, and one-dimensional laminar flamespeed. These utilities enhance the use of detailed chemistry. 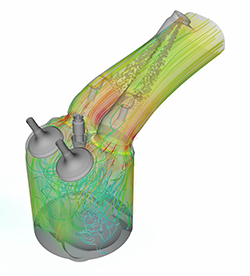 In addition to the detailed chemistry solver, CONVERGE offers a host of combustion modeling options for both premixed and non-premixed combustion so that you can select the best model for your particular needs. Combustion models in CONVERGE include the CTC/Shell, CEQ, ECFM, ECFM3Z, FGM, G-Equation, and RIF models. Accurate spray and turbulence modeling is critical for predictive diesel and gasoline combustion simulations. In order to obtain results that are as realistic as possible, CONVERGE contains a wide variety of spray and turbulence modeling options. CONVERGE includes both Reynolds-Averaged Navier-Stokes (RANS) and Large Eddy Simulation (LES) turbulence models. For spray, CONVERGE contains a host of options to simulate injection, breakup, vaporization, and other spray-related processes. All of the spray and turbulence models in CONVERGE are well-validated and powerful. Diesel and gasoline are not the only fuels that you can simulate in CONVERGE. You can perform simulations that are dual fuel or multi-fuel, and you can also simulate alternative fuels or jet fuels. Of deep concern to engine manufacturers are the constantly evolving emissions regulations. To help you meet these regulations, CONVERGE can simulate soot and NOx via its detailed chemistry solver or a number of alternative models. For NOx modeling, CONVERGE includes the popular Zel’dovich model. For soot modeling, CONVERGE includes the Hiroyasu empirical model as well as advanced phenomenological models based on detailed chemistry. Convergent Science keeps abreast of scientific advances related to combustion chemistry and internal combustion engines through a wide network of collaborations. These collaborations allow us to validate our existing models and implement new models. For example, we collaborated with IFPEN to integrate a new version of the ECFM3Z combustion model into CONVERGE. IFPEN is at the forefront of model development and has spent over 20 years researching and validating ECFM3Z. We continue to work with IFPEN to refine existing combustion and aftertreatment models and implement new ones. We are also invested in the Computational Chemistry Consortium. These collaborations, and many others, help us bring CONVERGE closer to fully predictive CFD. 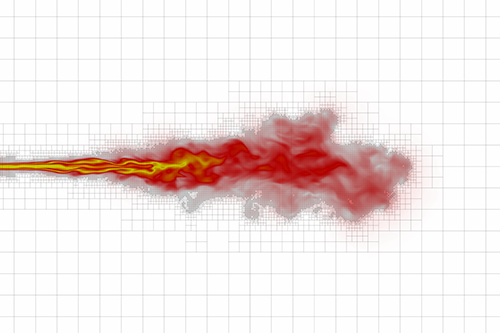 By riding the cusp of new research and investing in the physical science on which simulation is based, Convergent Science can bring you the latest advances in CFD. CONVERGE is widely used around the globe. 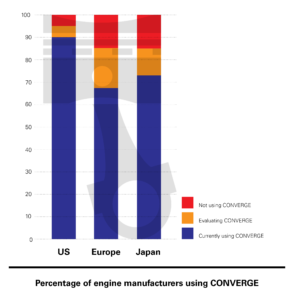 As shown in the figure below, the vast majority of engine manufacturers in the United States, Europe, and Japan are currently using or evaluating CONVERGE for their CFD needs. Although each engine manufacturer is unique, all of our clients benefit from CONVERGE’s autonomous meshing, advanced physical models, and ability to simulate complex moving geometries with ease.